Since Running Out of Blog Ideas continues to be one of my most popular blog posts, I decided to create Part 2 for you. The points I made in Part 1 are still valid. And yet, I have a few more years of experience under my belt, and I have a broader audience with different needs. One thing all of you have in common is coming up with blogging ideas. Whether you’re a business owner or a content marketing machine, you need smart blog ideas to help reach your ideal audience. In this blog post, you’ll learn to look at your keywords for blog ideas; check out your competitors’ blogs to see what they’re posting; and get more ideas from the National Association of Landscape Professionals (NALP). Schedule your first mow by April 1. Did you know that hiring a content writer for your green industry blogs will save you time? Read more in this post. One other point: Don’t forget your locations. If you cover a bunch of towns, you want to mention that somewhere on your blog. A lot of times I add the customer’s cities at the end of their blog, and I mention their state one to two times throughout the post. For example, if your customer base is in the Philadelphia, Pa. suburbs, you want to include Phoenixville, Royersford, and Valley Forge, Pa. at the bottom of your blog. Please note that I’m not encouraging you to plagiarize. I merely want you to evaluate your posts compared to your competitor’s blogs. Does it seem that your competitor understands their clients and prospects? How can you change your blogs to meet your audience’s needs better? I always tell my kids, “Know your audience” before you share your opinion. And when it comes to writing blogs, the most successful ones are when the writer addresses their unique audience. Demographics: Demographics include the region you serve, the people who hire you (young families, senior citizens, etc. ); if they have HOA regulations; and how much land the typical homeowner owns. Who makes the call? : The husband or the wife? The property manager? How much money does your client make? : Middle class, mid-upper class, higher end clients? Do they live in Manhattan during the week and enjoy their homes on the weekends? Once you know who you’ll be writing to, you can focus on their primary property problems. Questions like what specific lawn and landscape problems do your customers and prospects face in your region? How do they spend their weekends—working in their homes or running their kids around? Or both? How does your green industry company help solve their problems? How do you stand out from your competitors? Read more in this blog post. Have You Checked Out NALP’s Website Lately? Get more blog ideas at NALP’s sister site, LoveYourLandscape.org. Both sites provide treasure troves of blog ideas. If you use their info, don’t forget to site it in your blog’s text by hyperlinking like I’m doing in this blog post. Here’s one more tidbit to generating ideas. April is next month, and that means it’s National Lawn Care Month. And guess who has a toolkit for you to market your mowing, lawn care and landscape maintenance services? You got it, NALP. There’s a lot of simple, free things you can do to get more ideas for your lawn and landscape design blogs. Use your keywords, NALP resources and reading blog posts your competitors are putting out there. If these ideas seem overwhelming—especially since you’re just a minute away from the busy spring season—then you need the Landscape Writer. This year, focus on fixing your customers’ lawn care and landscape problems while I write blogs and social media content for you. Learn more about my writing services for the green industry by filling out my free consultation page, emailing me at wendy@landscapewriter.com or calling me Monday through Friday at 717-381-6719. PS – One other service I need to tell you about. One of my clients told me about Answer the Public. It’s easy to use and generates great blogging ideas. How’s Your Green Industry Website’s Know, Like & Trust? In the content marketing world, “know,” “like,” and “trust” are three characteristics that mark an effective marketer. Did you know that you can incorporate know, like and trust into your blogs and social media? As a local landscaper, lawn care or home service business owner, you already employ know, like and trust in your community. Word of mouth, the best type of marketing available, is born from your customers knowing you, liking you and trusting you to do a professional job. In return for your hard work, they recommend you to their friends and family. And yet, you also need to cultivate that type of relationship with the people who visit your website and on your social media channels. In this article, you’ll learn how to cultivate know, like and trust to get your sales prospects to click on your contact form. Do Your Prospects Know You? Consistency: To get your name on the map, you need to blog consistently—whether that means once a month or once a week. Make sure your blog topics are what your readers’ need―not what you think they need—and that means knowing who your ideal customer is. For example, are your customers classified as the upper- or middle-class? Do they need you to put fertilizer on their lawns, and they’ll do the rest, or do they need you to do all of their yard work, from fertilizing and weed control to mowing their lawns? You need to deliver blogs, videos and other content to them on a regular basis so they can get to know you. Sharing across social media: You need to be where your customers hang out. For example, if your ideal customers hang out on Facebook and Instagram, you need to develop your presence on those social media sites. To entice new followers to click on your contact button, run a lawn care special or another type of incentive. Responding: Make sure you’re responsive to your audience. If you get more clicks on your contact button make sure you respond in a timely manner. And if someone complains about your business on social media, don’t ignore it, but try to fix the problem. Read this blog post to see how you can connect your blog to your social media. Do your readers like you? Your content is relevant: You know your area’s specific problems and you blog about these issues. For example, if you and your customers live in a transitional zone, and it’s hard to grow grass, you blog about weed control and proper lawn maintenance. Or if you live in an area that’s made up of sandy soils, you blog about lime applications and other soil amendments. If you and your customers live in a flooding zone, you may post about drainage issues and how you can fix them. Your content focuses on helping your customers solve their problems: Before you put your call-to-action in place, you need to give your readers some DIY ideas that they can do on their own. Granted, your readers may not employ any of these ideas, but at least you’re empowering them to make that choice. For example, you may need to remind them that good lawn maintenance requires raising the mower blades, so they only take a third off the top of the grass when they mow, or that they should set their sprinkler system timers for early morning irrigation. You don’t talk down to them: People are busy, and the majority of folks don’t want to know the nitty-gritty of a solution. You want to tell them the basics—but don’t feel you need to use a lot of jargon or technical turf talk. “Just the facts” is what they need and want. Even though I wrote this blog post in 2017, it’s still relevant for 2018! Do your readers trust you? Do you publish consistently? You may not have time to post every day or even every week. But can you post every other week? Consistency also includes posting for the majority of the year. Just because the mower is put away and a hard frost has put lawn grass into dormancy doesn’t mean you should stop blogging or adding content to your social media channels. You may want to cut down during the winter since people have their minds on the holidays, but that doesn’t mean you go dark until March or April. Are you active on social media? You should be active on social media. Again, where do your ideal customers hang out? If it’s on Twitter, then you should be on Twitter. If it’s LinkedIn, you should be on LinkedIn. For your company page, make sure you’re posting tips, tricks and hacks to your prospects. And it doesn’t have to be about lawn care or landscaping for 12 months of the year. For example, I saw a lawn care company share a recipe on Twitter, and it’s totally appropriate because it’s close to the winter holidays. Nobody is talking about grubs or green yard grass right now. Spice it up and make it fun. Look at your content through your customers’ eyes: If you were a homeowner, would you feel that your biggest lawn care and landscape problems were addressed on your website’s blog? If you were a potential customer, do you feel as though your company cares about that sales prospect? Sometimes, social media and blogging may feel a bit “touchy-feely,” but that’s what the current market is looking for—companies that take a more personal, compassionate approach to their marketing. If your readers and followers feel that they know, like and trust you, they’ll click on that hyperlink that leads them to your contact form. If you’re a busy lawn care, landscaping, or home service business, and you don’t have time to craft a blog or social media content to reach your local audience, call me at the Landscape Writer today, 717-381-6719, email me at wendy@landscapewriter.com, or fill out my free consultation form. El Morshoy, Georgina, “30 Ways to Build ‘Know, Like and Trust Factor that Grows an Audience,’” Copyblogger.com: January 16, 2013. New post for Home Improvement Entrepreneurs: On the Landscape Writer, guest blogger Jason Griendt of Render 3D Quickly shares his thoughts on selling new construction home upgrades. A home is an essential aspect of the human life. It offers us comfort as well as a sense of safety. When buying or constructing a home, the buyers look for the best house. They try to create an environment that suits them. As time goes by, one might feel the need to change the orientation of their home. Also, some parts of the building might begin falling off after some time. The homeowners will look for a remodeling contractor to fix their rooms or give their house a new look. As a home renovation professional, you must position yourself strategically on the market. You need to know how to sell your services. Below are three ways to sell new construction home upgrades. Once you’ve done a great job, your clients will recommend you to their friends, colleagues, and family. With time, your brand will grow bigger. Therefore, it’s your responsibility to ensure that you offer quality upgrades to all your clients. This strategy will help you sell your services to more people, both directly and indirectly. When handling a project, always remember that you’re also working on building a name for yourself. It may take a while to sell referrals but it will be worthwhile. What’s more, you’ll get repeat business which is as good as getting a new client. Meeting and interacting with people is a number one way to sell a product, service or idea. When working on home upgrades, try to meet with your clients. You may never know what will come out the meetings. They might want more of your services or introduce other people to you. Be sure to make the meeting friendly so that you can build trust with your client. Once an individual feels that they can trust you, it easier to present whatever you’re selling. Give the client time to think about your offer. This way, you’ll avoid misunderstandings in the future. If your client seems to be willing to do business with you, offer them consultancy at a lower fee or for free. This will be a great way to give them a sample of what you can do. Technology advancement has made work easier. Additionally, it has reduced the time required to perform certain tasks. Undertaking home improvement projects involves the development of plans and 3-D images. These drawing can help you sell new construction home upgrades as they enable the homeowner to visualize the end product. You can use a laptop, projector or virtual reality equipment. You’ll create the design on CAD software and present the renderings using a VR headset. With virtual reality technology, clients can “walk” through space. It’s easier for them to point out the changes they want. Jason Griendt is the man behind Render 3D Quickly. He specializes in online business as well as mechanical engineering. His company, Render 3D, has made him a business leader in the construction industry. The entrepreneur attended Fanshawe College in Canada. As a landscaper, your business focuses on visual appeal. With each project you tackle, your primary focus is creating a landscape that’s as aesthetically pleasing as it is functional. Following this line of reasoning, it’s only natural that your potential clients want to see some of the projects you’ve completed in the past. Maybe you’ve already considered this; you may have a website with a smattering of snapshots of some of your old projects. But how much thought and effort have you put into your marketing? If all you have to show your prospects are a few photos that were practically afterthoughts, you’re not really doing yourself justice. Consider focusing more on your marketing strategy, making professional photography the first item on your “to-do” list. If you’re wondering why customers rely so heavily on photography, the answer is pretty clear: Humans are visual creatures, especially when it comes to art and design. It’s difficult to envision something without seeing examples. That’s especially true with landscaping. It should come as no surprise that high-quality images drive sales. For most businesses, photos are included on a website as attention-grabbers; they’re meant to drive traffic to the site so visitors will then read the content provided. Landscaping is an artistic industry, however. For your visitors, the photos are the main event. That’s why you’ll want to put them front and center. You can add a portfolio to your website using a portfolio template. If you’re not tech savvy, hire a web designer to do the work for you. A great portfolio will showcase your best work so it’s one of the first things visitors see when they visit your site. This is one of the easiest ways to drum up business, and it’s simple to set up. Because so much relies on the quality of your photos, you should never rely on your own cell phone camera to get the job done — unless you happen to have great iPhone skills. Instead, hire a professional photographer who can visit each job site and take a few shots you can use for your website. It’s a small expense compared to the return you’ll make from all the new business. With a professionally-styled portfolio, your website is sure to impress — but first you have to drive people to it. Social media is the easiest way to do this. You can use any platform you like — Facebook and Twitter are both popular options. However, because your business is so visual, you might have better luck starting with Instagram. Instagram lets users post images to their account each day. You can use hashtags to describe what’s in your photo so users can easily find your images using search. Over time, you’ll gain followers and your account will grow. By adding your website link to your profile, you can send Instagram users directly to your site. If all the statistics in the world won’t convince you that photography is the key to unlocking the potential of your business, consider our story: We started investing in photography for our own business, Renaissance Pools, and we’ve seen great results so far. Throughout our website, you’ll find professional-quality photos that help us stand apart within the industry. With a little time and effort, you can do the same. We wish you the best of luck. Benji Horning of Renaissance Pools in Henderson, NV wrote this blog post and supplied the photograph. The days are getting shorter, and the air is crisp. That means it’s time to tell the folks who read your blogs, watch your videos and follow you on Facebook to make their appointments for fall lawn and landscaping jobs. In this blog post, you’ll get six blog ideas to tell your audience about your fall lawn and landscape maintenance services. There is so much for homeowners to know about taking care of their lawns and landscapes come fall. However, many of them—especially younger homeowners—may not know what these tasks are until you tell them. Use your blog to educate your readers about lawn and landscape maintenance. Read more in this blog post. In each of your blogs, you explain the benefits of getting these chores done by a pro compared to the cons of doing it themselves or not doing it at all. Why You Need Your Gutters Cleaned Before Winter. Is your blog guiding your social media? Read more in this blog post. Give these ideas a try and see what results you get. Don’t forget that you get more bang for your blog when you incorporate social media, such as Facebook posts, that correspond with your blog. If you want to get more people to your website, and you don’t have time to write blogs and social media content, call me, the Landscape Writer at 717-381-6719 or fill out my free consultation form. So, we’re heading into the middle of July. Have you let your customers know that this month is Smart Irrigation Month? You can leverage your blogs and social media content in July by teaching about your irrigation sales and service. And if you don’t work on lawn sprinkler systems, you can still educate your readers about smart watering techniques. Your readers need to know that their lawns and landscapes only need a 1” – 1½” of water per week—and that includes any rain that your area had in that week. They need to know that regularly maintaining their lawns—how they keep their yards, such as mowing, fertilizer treatments and weed control—affect how well their lawns will survive a drought or a hot, dry spell. Your prospects need to know that they’ll save money when they use correct watering techniques. Even though a new sprinkler system is a significant investment, remind your readers that they’ll reap savings on their water bills in the years to come. Tell your prospects about the benefits of hooking up their Smartphone to their irrigation systems. Encourage your prospects to get their older system retrofitted with today’s gadgets to save water (and money on their water bills). Give your readers landscape ideas such as hydro-zoning, microclimates and other water-saving garden tips. Use these blogs to include other water-saving add-on services you provide for your local area. Read this blog post to stand out from your competitors. Sure, you know all of the above like the back of your hand. But assume your clients don’t know these tips or services that you provide. Check out three places to get ideas for your landscaping blog. Keep yourself in front of your prospects’ minds by sharing ideas and tips on your blog and Facebook page that will save them time, money, and other pain points. This way, they turn to you when they need a mowing service, landscape maintenance service or better yet, your irrigation system services. If you don’t have time to write a regular blog and keep up with your Facebook posts, call me today at 717-381-6719 or fill out my free consultation form. Help Your Customers Celebrate National Homeowner’s Month! So, you’re out of blog ideas that inform your readers about best lawn and landscaping tips. So, what else do you readers need to know? How about focusing on special months? For example, April is National Lawn Care Month, June celebrates National Homeowner’s Month, and July is Smart Irrigation Month. From April through July, you could have 8-10 different blog topics to share with your readers. They just moved into your area, and they don’t know the first thing about taking care of their lawns and landscapes. They’re gearing up to sell their home. You can share pointers on curb appeal and how your lawn and landscape company can help them achieve it. Don’t forget to blog about your lawn care services such as weed control. A yard acts like an air conditioner—it’s 31 degrees cooler than asphalt and 20 degrees cooler than bare soil. If your reader has trees, you can point out that their attic is 40 degrees cooler than if they didn’t own any trees. You can point out how lawns also prevent erosion problems. And you can mention how lawns provide a haven to play, rest and relax. You can mention that homes sell faster when the property’s curb appeal is well-maintained. Connect these ideas with good home-owning habits, and you now have a blog or blogs that will interest your readers. Read more about celebrating National Lawn Care Month with your blog. Lawn Services OR Landscaping Near Me—Replace “Near Me” with the three popular cities that you serve. Did you know that you’re a lot like your customers? You want to save time too—only you may want to save time from having to come up with blog topics, blogs and social media management. Do you marry your blog post with your social media? If that’s you, call me today at 717-381-6719, email me at wendy@landscapewriter.com or fill out my free consultation form how I can turn your blah blogs into customer-loving ones. Connect with me on Facebook, Twitter @LawnNLandwriter and LinkedIn! 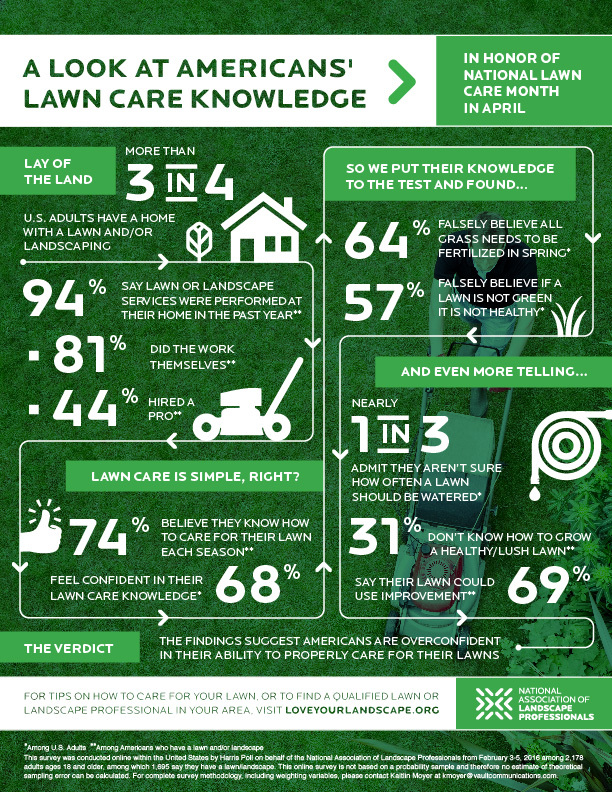 The National Association of Landscape Professionals (NALP) had a fascinating graphic on their website regarding the average homeowner’s knowledge about lawns. Do you realize that this is a hotbed of ideas to catapult you, the lawn care owner/operator or landscape maintenance contractor, into the go-to company for lawn care and landscape knowledge? You don’t have to get real technical about these tips either. Remember the saying, “Keep It Simple, Sam.” Okay, I know it’s not Sam, but Stupid. But I wasn’t allowed to say stupid growing up—so please bear with me. Just give your audience the basic information they need–such as only take off 2 1/2 – 3″ when they mow in the spring. Or remind your followers that they should water their lawns in the early morning hours rather than at lunchtime or in the evening. Simple tips can make you the local expert. If you don’t have time to employ these ideas, call me, the Landscape Writer, at 717-381-6719, email me at wendy@landscapewriter.com or fill out my free consultation form to learn more.